The AutoMet 466A Data Logger combines the performance necessary to meet worldwide standards with ruggedness, reliability, and portability. Without complex programming, the 466A Data Logger acquires, displays, logs, alarms, and transmits critical data. Easily integrates with sensors to meet the data collection requirements of key regulations, including EPA PSD, and WMO. Communicating with the 466A can be as simple as connecting directly to a PC or printer, or by using modems, radio telemetry, cellular telephones, or a portable data transport module. The 466A interfaces to a wide variety of sensors, including those measuring wind speed, direction, temperature, humidity, barometric pressure, solar radiation, and rain amounts. When using Met One’s 500 series, the 466A automatically detects the sensor. 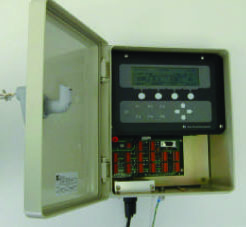 Up to eight analog inputs (including one counter for wind speed), rain gauge counter, and one wind sigma calculation can be connected simultaneously. Once acquired, data can be displayed, stored, or evaluated for alarm conditions. Alarms allow relays to trigger local controls, annunciators, or communications devices. The large display, and screen-specific keypad provide on-site information and easy programming. The menu-driven screens mean users do not need to understand the complex programming strings that are required by many data loggers. The AutoMet’s portability and quick deployment are enhanced by a convenient power system, including a 12 vdc primary operating voltage. This, along with convenient optional carrying cases, permits the AutoMet’s operation in remote areas where solar power and battery-backup are needed.